Our family is currently saving up for a home. 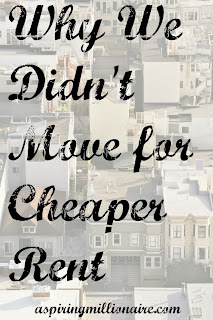 The biggest detriment to our progress is our rent payment. 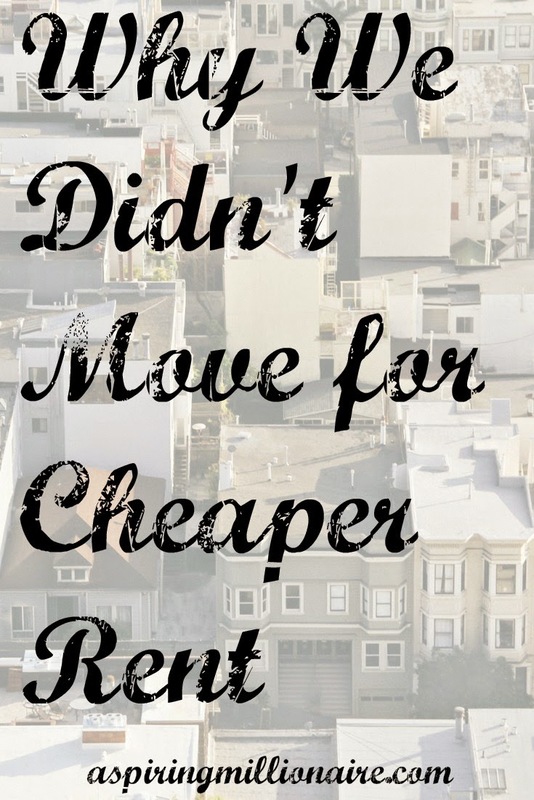 It's smaller than it could be, as rent has risen in our area dramatically since we moved in some years ago, but it's still a bigger number than we'd prefer to be paying. We wracked ourselves over the decision for weeks, but we ended up not doing it. There were several factors that went into our decision. Location. The neighborhood we live in now has quick access to almost all of the major highways in our city. My job is a bit unpredictable and mobile for the short-term, so being able to get anywhere quickly is high on our priority list. It is also very close to my husband's school. He mostly takes night classes, heading out straight away when I arrive home from work. Making the move to another municipality was going to put a significant damper on achieving our immediate career goals. Schools. The school district we would have been going to had we decided to make the move isn't horrible. It's not the best in our area, but I wouldn't have anything against sending my children there. I wouldn't, that is, if one of my children didn't require special education. Their program was seriously lacking, and we're very happy with the results we're seeing from the hard work of the educators in our current school system. Keeping that progress up is worth far more than $150/month and our own bedroom. Our district isn't the best in our area, either, but they really do put a strong emphasis on their children with special needs. Utilities. When we first moved to our current place, we got duped on our utilities. It wasn't a straight out lie, but more of an important omission. Most homes in our area use gas for heating. So when we were told the only utility we'd have to pay was electric, we were thrilled! That winter we found out our heating ran off electric, as well. Even with that added cost, we'd still be paying more in utilities at the new place. We'd have to pay for electric, gas, and water. The water bill, combined with heating and cooling a much larger space, would bring our total bill for the month close to the rent we're paying now. The actual cost of moving. The last time we moved, we did it ourselves and still spent close to $400 when all was said and done. If we did it again, we'd have to get a bigger truck as the kids have added quite a few more worldly possessions to our repetoire. We'd also have to get a sitter for them while we moved. We'd probably have to get a sitter while we were packing everything up, too, or spend money on entertainment for them while one of us took them out and the other stayed home and did the dirty work. Then there's all the little costs you forget about when you're moving into a new place; a shower curtain (as we currently only have a glass door,) nails and hardware to hang things, and cleaning supplies you don't use regularly, but come in helpful when you're leaving for the last time or entering for the first. After we calculated all of this out, we wouldn't start seeing a return on our move until about five months in, and that's if we ignore utilities. We hope to buy in the next year to eighteen months. Ultimately, the new place may have been marginally cheaper. It may have given us more space and an easier time playing outdoors. But the educational opportunities, and the opportunity cost it would inflict on our careers, were enough to make that little bit of extra money not worth it. Have you ever had to make a choice that looked financially good on paper, but wasn't the best option for you or your family?